American Housewife has had a great second season, and I've been particularly pleased with the development we've gotten with characters that aren't Katie. Tonight's episode will feature an entire story about just the kids, so I'm excited for it and I hope it develops their relationship as siblings even more. Katie and Greg are at an event called Flavor of Westport, where there's a ton of food Katie hates and people Katie tries to avoid. Katie is miserable, but then she runs into someone that she can actually relate to. Greg bonds with her husband Zach, and they decide to get together with them. Doris then tells them that they don't have kids, which might be a problem. Greg decides to hide the fact that they have kids, and they set up a dinner with Courtney and Zach. They put Taylor in charge and try to leave, but Anna-Kat tries to come recap her show to them. They pawn he roff on Oliver, and quickly hightail it out of there. Anna-Kat asks Taylor to write a story for her for school, and she threatens her. At dinner, Greg and Katie tell Courtney and Zach a fake story about an awesome thing they claim they did, and then Courtney and Zach ask them to go somewhere else, even though it's already past their bedtime (9:30). The next day, Katie and Greg get a text from Zach that says that they had fun. Meanwhile, they think have a bunch of stuff to do around the house, but they find out that the kids already did stuff. Taylor and Oliver tell Anna-Kat about the stories they wrote, but she hates them and demands a darker, weirder story. Katie and Greg are oblivious to Anna-Kat's horrible treatment of Taylor and Oliver, but then they see Courtney and Zach and force them to go into a candy shop. They abandon their kids and start hanging out with Courtney and Zach. 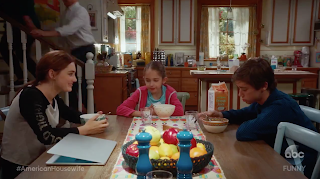 They get invited to New Hampshire, and they agree to go with, and then their super normal daughter Anna-Kat runs out screaming because of all the sugar she ate. Katie and Greg are pumped for their overnight date with Courtney and Zach, and they get ready to go. They don't feel guilty or anything, and then they turn around to go to the Kid Lit Festival. THey're super bored, and then Anna-Kat comes on. They're absolutely horrified by her story, as are the other parents. Taylor and Anna-Kat are the only ones that clap for it. Katie tries to blame the kids for this disaster, but they realize that it's actually their own fault. Later, they decide to tell Courtney and Zach that they have kids, but then Courtney and Zach tell them that they're pregnant. I really didn't enjoy this week's American Housewife. It was really generic and boring, as so cliche and overdone. I've seen so many sitcoms with an episode similar to this one, and I expected more from this show. I'm holding it to a higher standard than most shows, because I know for a fact that if can and will do better. This was just a very disappointing episode, and it wasn't even that funny. It was also super predictable. Katie and Greg's plot was pretty terrible except for part where they saw the error of their ways, which was easily the best part. The story with the kids was better, but even it wasn't really that great. In most other episodes, it would've been the weaker story. Katie and Greg also seemed out of character this week. While their kids drive them crazy, they still love them and I couldn't see them doing anything like this. It's also weird that this was Greg's idea, as it's even more out of character for him than it is for Katie.